These cupcakes are inspired by Hollis Wilder from Cupcake Wars. I love her ideas, and love that she brings her culinary experience to the pastry world. The cake is a cinnamon swirl sour cream cake, that is moist and fluffy, and much like a coffee cake. 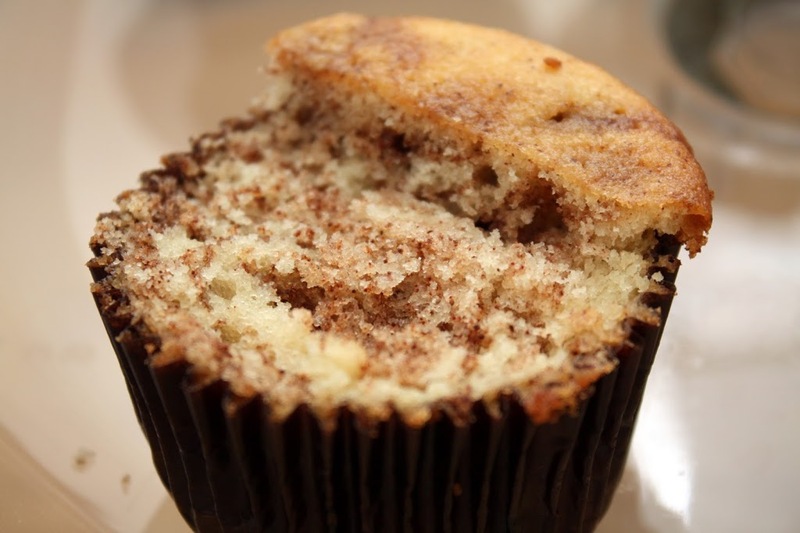 The key to the pop of cinnamon flavor is to fold in a brown sugar-cinnamon mixture, without fully blending. See swirls below. 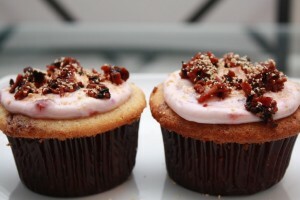 The frosting is a strawberry cream cheese with maple butter, and the topping is maple-glazed turkey bacon, with maple sugar sprinkled on top. Maple butter and maple sugar are pretty amazing (but pricey)—check your local health food store to find those items! In a mixer bowl, with a paddle attachment, cream the butter and sugar together. Scrape down the sides of the bowl, and then add the vanilla and one egg at a time, scraping down the sides of the bowl after each addition. With the mixer on low speed, add the flour mixture and sour cream, alternating between the two, beginning and ending with the flour. Mix the cinnamon and brown sugar together in a small bowl and fold by hand into the batter. Do not fully mix into the batter, it should be swirled in. Fill regular sized cupcakes, bake for 26-28 minutes or until golden and baked through. Once cooled, top with cream cheese frosting (mix 1 pound cream cheese, 4 tablespoons maple butter, 1/4 cup strawberry jelly and 1/4 cup fresh strawberries, hulled, and finely diced), turkey bacon (cook as usual until crisp, then lightly coat with maple syrup and continue cooking over low heat until slightly caramelized), and maple sugar. Yum! And I would know!! !